Bonnie Adama has created a rich resource of 73 games proven in the classroom to help you teach kindergartners basic math skills. With these skills, your class will be well on their way to success in elementary school math. Kindergarteners will work on number recognition from 1-6 in this game. When they have mastered this, try the variation which involves number recognition to 12 and simple addition. 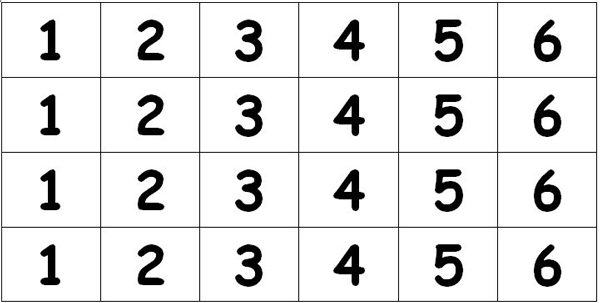 The winner of Cross Out is the first person to put a marker on all six numbers. Players take turns rolling the die and putting a marker on the corresponding number on his/her number line. If a number already has a marker on it, that player loses his/her turn. Variation: Roll two dice and add them together. Each child will need the 2-12 number line. This game seems simple, but it really helps young children recognize the dots on the dice. When they begin, they may need to count the dots each time, but soon they ought to learn what number the dots represent without counting them.